Royal Canin Canine Sensitivity Control SC 21 is a specialised dog food, developed to help combat food allergies and intolerances. 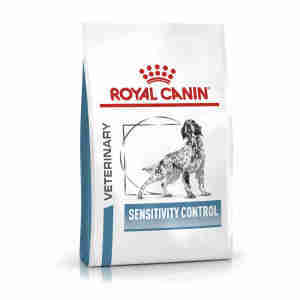 Royal Canin Canine Sensitivity Control contains a carefully chosen blend of nutrients designed to provide all the vitamins and minerals your dog needs, whilst also supporting its digestive system. It also uses a single, simple protein source which makes it easily digestible for even the most sensitive stomachs. This food promotes your dog’s well being on more than one front. Its unique, patented formula enhances the skin's ability to act as a natural barrier to allergens. Alongside this, fatty acids EPA and DHA, so important for healthy skin and digestion, help to repair any damage done by allergens and boost your dog’s immune system. It also contains high levels of L-tyrosine, which promotes a healthy, shiny coat that is strong in colour. contains all the nutrients your dog needs for a healthy gut. Some signs that your dog could be suffering from allergies, intolerances and sensitivities include vomiting and diarrhoea, itchy skin or ears, a dull coat, and unexplained hair loss. Other causes may include inflammatory bowel disease, colitis and gastritis. Most of these can be treated effectively with a simple change of diet to a food high in nutrients and low in potential allergens to help keep symptoms permanently at bay, but as always, it is best to consult your vet on the most appropriate course of action. Just like in humans, food allergies, intolerances and sensitivities are common in dogs of all ages and can cause considerable pain and discomfort. Therefore, it’s important to take your dog to the vet the minute you notice any symptoms. Because veterinary diets are formulated for the nutritional support of pets with specific clinical conditions, we recommend that you only use them under professional advice. For more information on feeding Royal Canin Canine Sensitivity Control to your dog, please consult your veterinary surgeon. COMPOSITION: tapioca, dehydrated duck meat, hydrolysed poultry proteins, vegetablefibres, animal fats, beet pulp, fish oil, soya oil, psyllium husks and seeds,minerals, fructo-oligo-saccharides, marigold extract (source of lutein). ADDITIVES (per kg): Nutritional additives: Vitamin A: 25000 IU, Vitamin D3: 800IU, E1 (Iron): 41 mg, E2 (Iodine): 2.8 mg, E4 (Copper): 10 mg, E5 (Manganese):54 mg, E6 (Zinc): 203 mg, E8 (Selenium): 0.1 mg - Preservatives - Antioxidants. My 2 year old cocker spaniel is a scavenger , he'll eat anything when we are out for walks. He's developed a sensitive tummy after he ate a piece of plastic that got stuck and had to be removed .My vet advised I try this food and it works . No more sickness and he's back to normal. Great product, my TT had very bad episodes of tummy upset and was very fussy what food she would eat but since she is on this food she had no upset tummies and eats up every meal. Bought after vet advice following colitis symptoms for my westie 8 years ago. He is symptom free plus his skin allergies have improved. Excellent quick service.